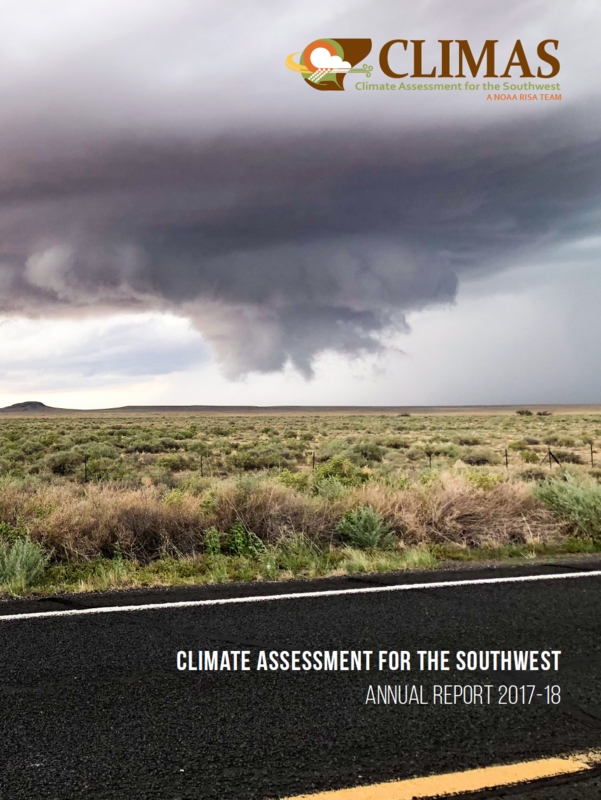 The Climate Assessment for the Southwest (CLIMAS) program was established in 1998 as part of the National Oceanic and Atmospheric Administration’s Regional Integrated Sciences and Assessments program. 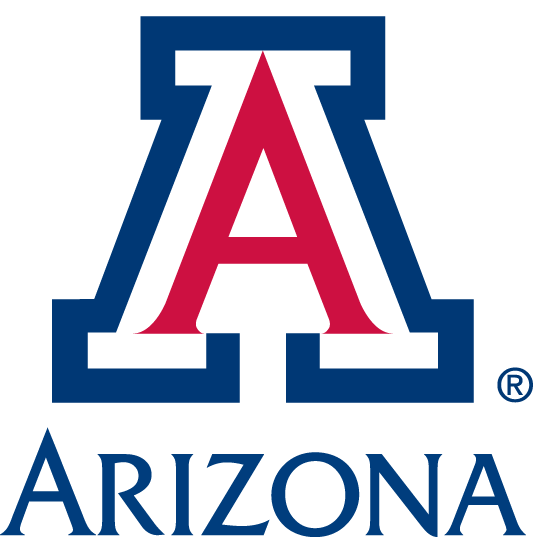 CLIMAS —housed at the University of Arizona's (UA) Institute of the Environment—is a collaboration between UA and New Mexico State University. 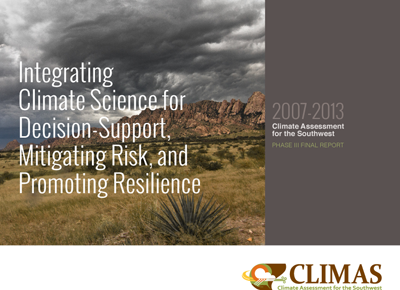 The CLIMAS team is made up of experts from a variety of social, physical, and natural sciences who all work with partners across the Southwest to develop sustainable answers to regional climate challenges. 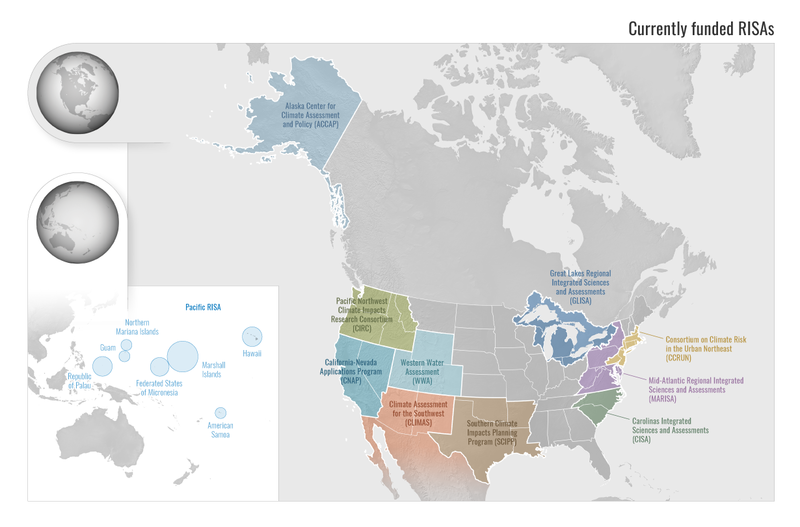 The CLIMAS team and our partners work to improve the ability of the region’s social and ecological systems to respond to and thrive in a variable and changing climate. The program promotes collaborative research involving scientists, decision makers, resource managers and users, educators, and others who need more and better information about climate and its impacts. Current CLIMAS work falls into six closely related areas: 1) decision-relevant questions about the physical climate of the region; 2) planning for regional water sustainability in the face of persistent drought and warming; 3) the effects of climate on human health; 4) economic trade-offs and opportunities that arise from the impacts of climate on water security in a warming and drying Southwest; 5) building adaptive capacity in socially vulnerable populations; 6) regional climate service options to support communities working to adapt to climate change. Why is CLIMAS work important? Climate variability and the long-term warming trend affect social phenomena such as population growth, economic development, and vulnerable populations, as well as natural systems. This creates a complex environment for decision making in the semi-arid and arid southwestern United States. For example, natural resource managers focused on maintaining the health of ecosystems face serious climate-related challenges, including severe sustained drought, dramatic seasonal and interannual variations in precipitation, and steadily rising temperatures. Similarly, local, state, federal, and tribal governments strive to maintain vital economic growth and quality of life within the context of drought, population growth, vector-born disease, and variable water supplies. These uncertainties surrounding the interactions between climate and society are prompting decision-makers to seek out teams of natural and social scientists—like those that comprise CLIMAS—for collaborations to help reduce risk and enhance resilience in the face of climate variability and change.